Price conscious all-rounder. 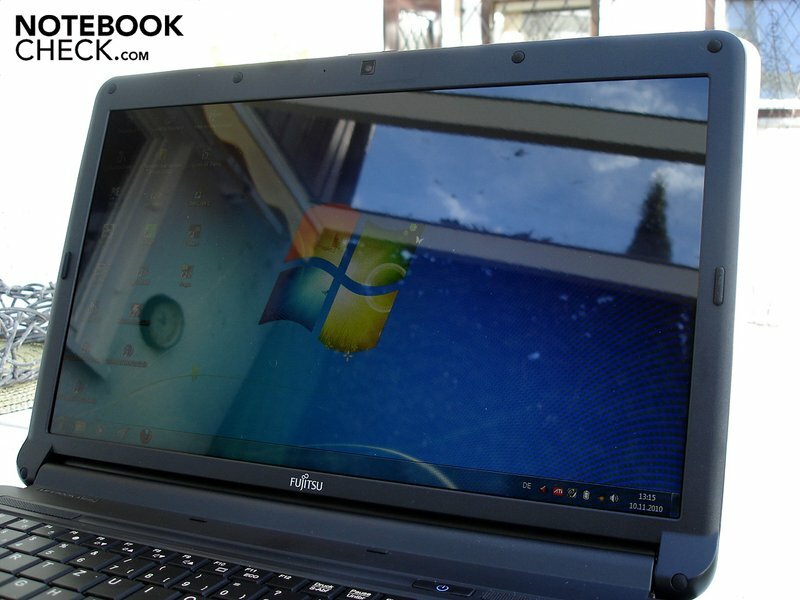 Fujitsu tries to prove that strong multimedia notebooks don't have to cost around 1000 euro right away, with the Lifebook AH530. A new Intel dual core CPU and a mysterious ATI Radeon HD 550v GPU are the ingredients for this purpose. Currently, three different Lifebook AH530 models are available in Germany. The AH530MF072DE has the best price and already goes over the counter for around 590 euro. The buyer gets a four GB DDR3 RAM and a 320 GB hard disk aside an Intel Pentium P6100 processor for this price. 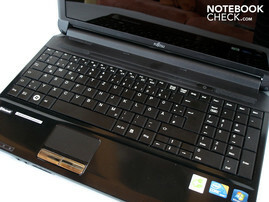 For a surcharge of merely 40 euro, you can buy the AH530MF112DE that we reviewed. It also has a four GB DDR3 RAM and a 250 GB HDD. However, it can serve with the significantly stronger Core i3-370M (2.40 GHz) as the processor. And finally, the current top model, AH530MF122DE, adds up to a price of about 830 euro. While the RAM capacity remains unvaried, the hard disk size increases to 500 GB. Further configuration features are a Core i5-460M processor with 2.53 GHz and a built-in Blu-Ray player. All models have the graphics card in common: ATI's Mobility Radeon HD 550v promises enough power for casual gamers. 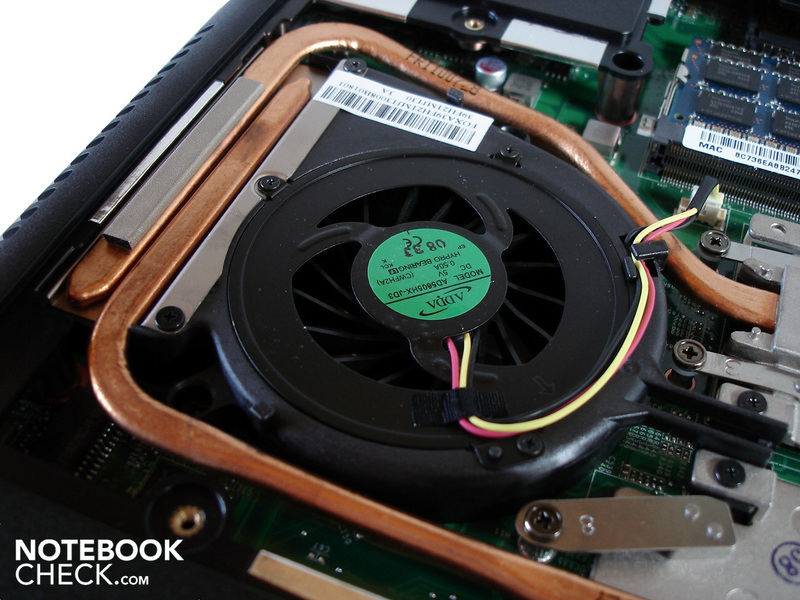 If you're not dependent on a dedicated graphics card, you might also be content with the Lifebook A530 (without an "H" in the name). You can find the corresponding review on our site. 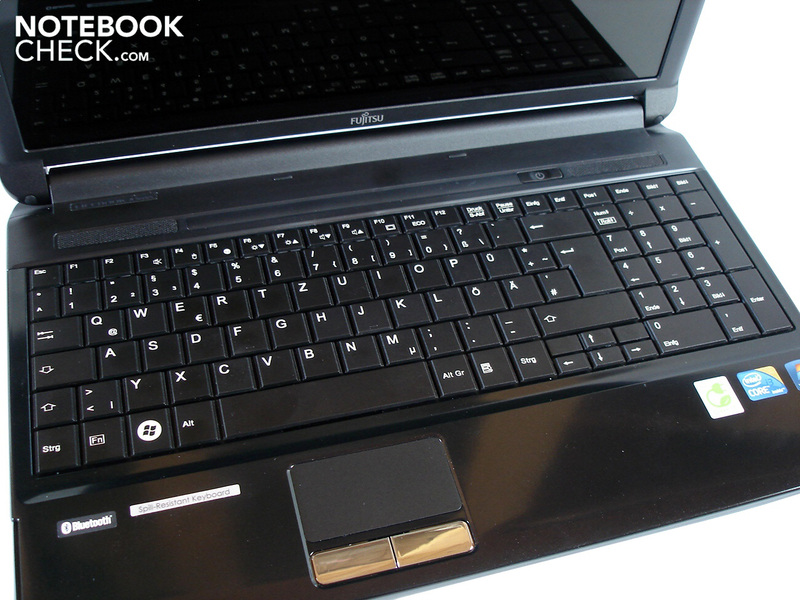 We would describe the Lifebook AH530's design as chic. 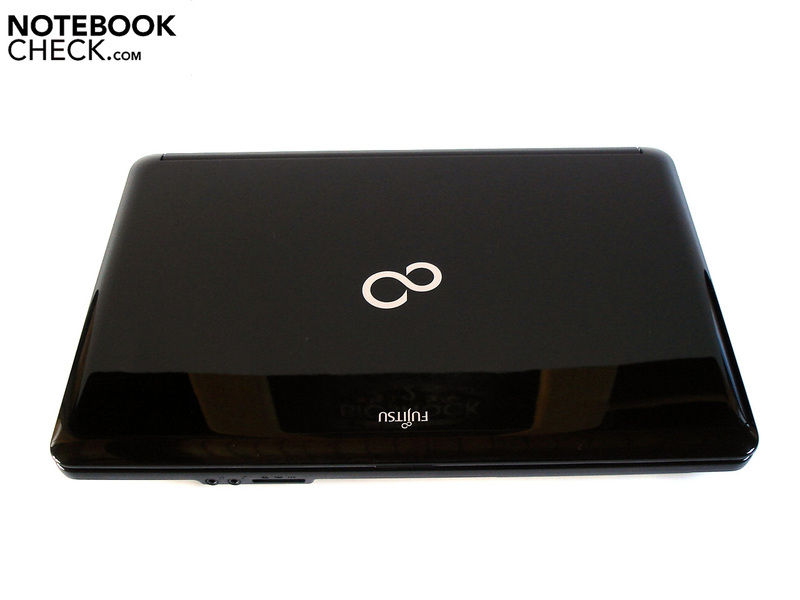 Fujitsu unexceptionally uses black plastic surfaces in a piano lacquer look, which make a fairly elegant impression. This remark however only applies when the notebook is perfectly polished. That is, the sensitive high-gloss surfaces tend to smudge intensely. Fingerprints and dust particles soon have the upper hand. The 15.6 inch and 378 x 252 x 39 mm sized case can make up for this imperfection with its pleasant weight. 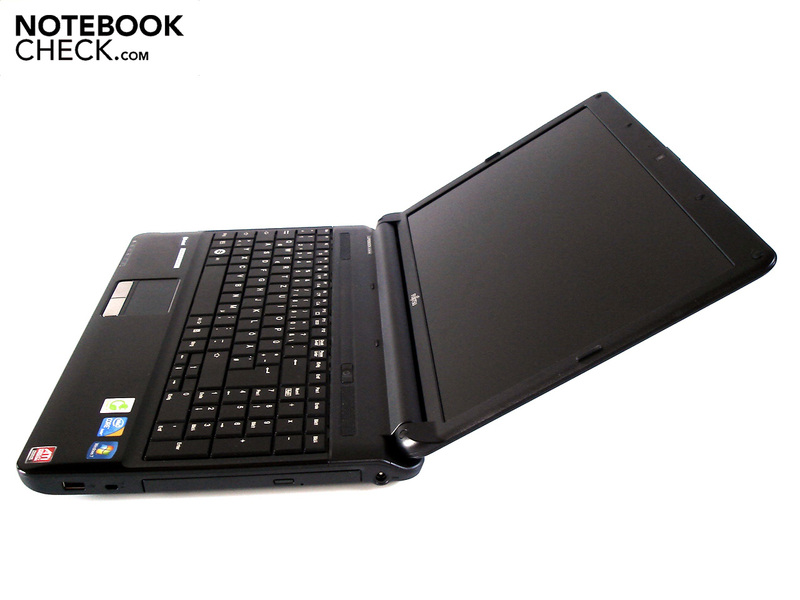 The Lifebook AH530 can be carried around easily with about 2.5 kg. 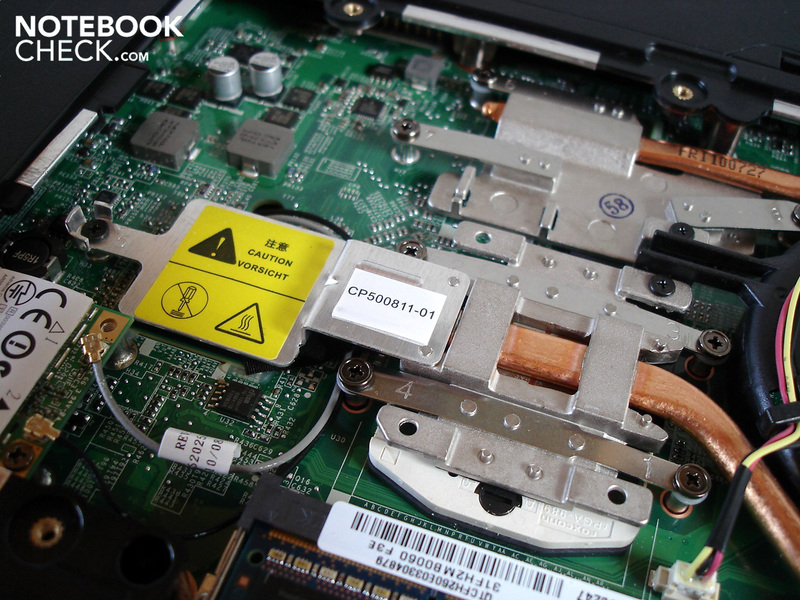 Another of the Lifebook AH530's strengths is its exceptionally good workmanship. No flaws could be found even as we looked closer. At least the base unit's stability is convincing. The notebook's top and bottom side only yield slightly even under strong pressure. The lid could have done with more stability. Pressure on the display bezel quickly leads to image errors. Finally, the hinges do a good job. The display is kept well in position on vibrating surfaces. However, the hinges are pulled very tight so that the base unit lifts when opened. Fujitsu has however placed most connections on the left side. Aside from an RJ-45 LAN port and a VGA, respectively HDMI out, there are two additional USB 2.0 ports (a total of 3 USB 2.0 ports) found on the left. 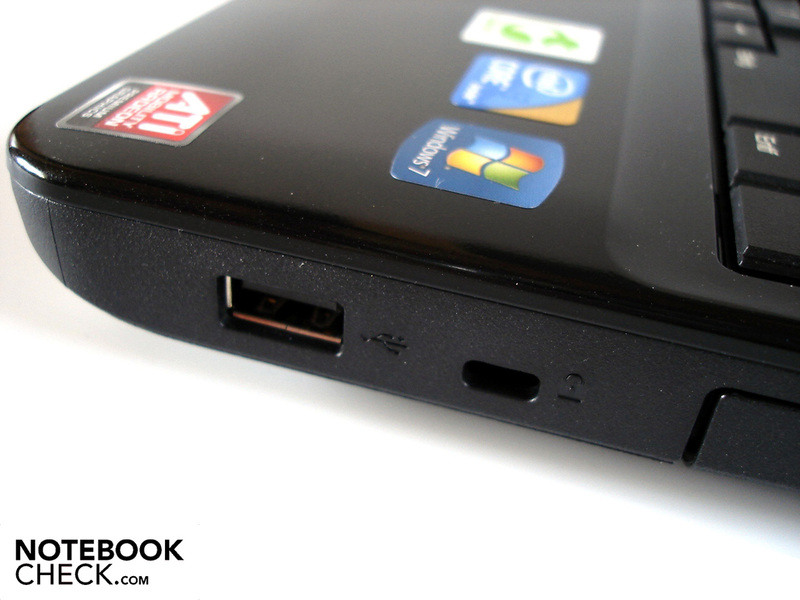 A 54mm ExpressCard slot finishes the side off. However, it is placed so unfavorably that it could obstruct the ports in its vicinity. Basically, we consider the port distribution as partly well-considered. Particularly the HDMI out and the USB ports are located very far front. Wireless communication is no problem with the Lifebook AH530. Fujitsu has remembered both Bluetooth (version 2.1) as well as WLAN (802.11 b/g/n). 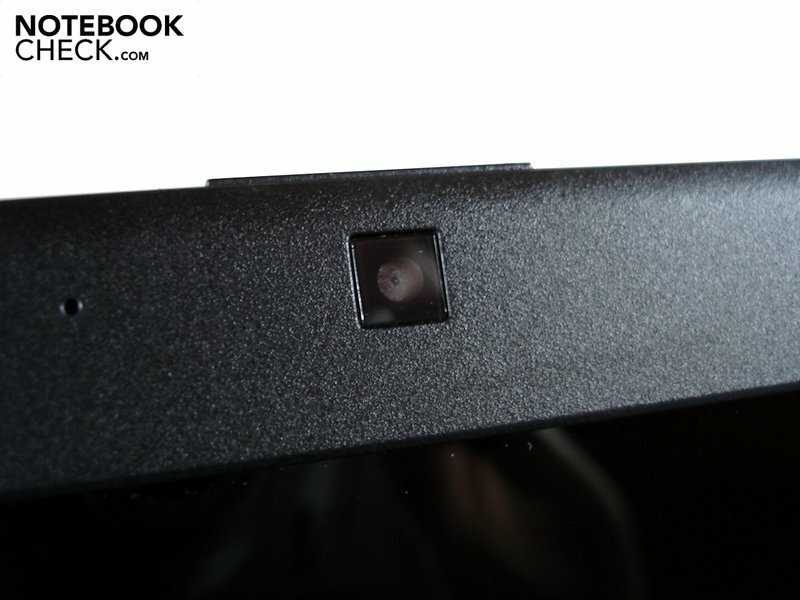 Otherwise, the notebook can serve with a built-in microphone and a 1.3 megapixel webcam. There is no fingerprint scanner. 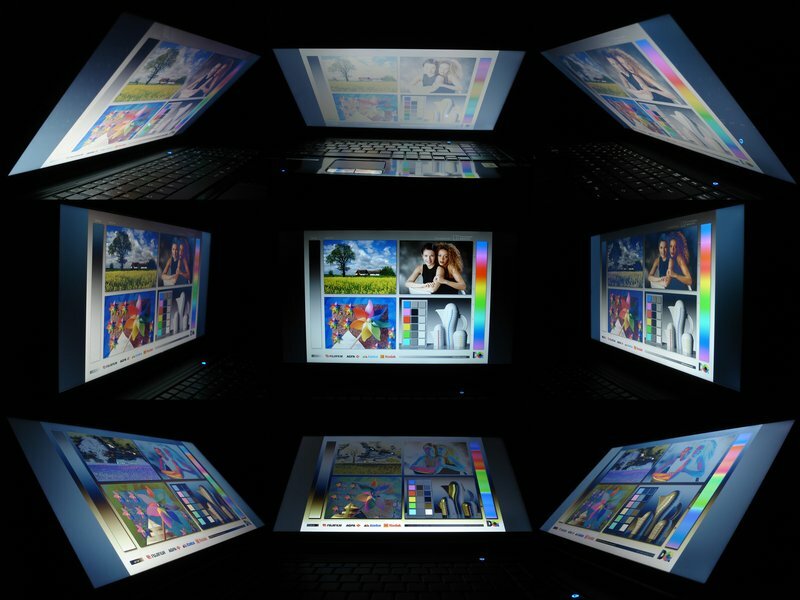 In opposition to many other big manufacturers like Sony, Toshiba, Acer or Asus, Fujitsu doesn't clog its Lifebook AH530 extensively with superfluous software. Except for the necessary drivers and a few Fujitsu programs, the system is fairly clean (see screenshot). There are hardly any popups and the performance is already impressive in the state of delivery. Beyond that, Fujitsu deserves praise for the scope of supplies. A recovery DVD with the operating system (Windows 7 Home Premium 64bit) isn't a matter of course anymore. 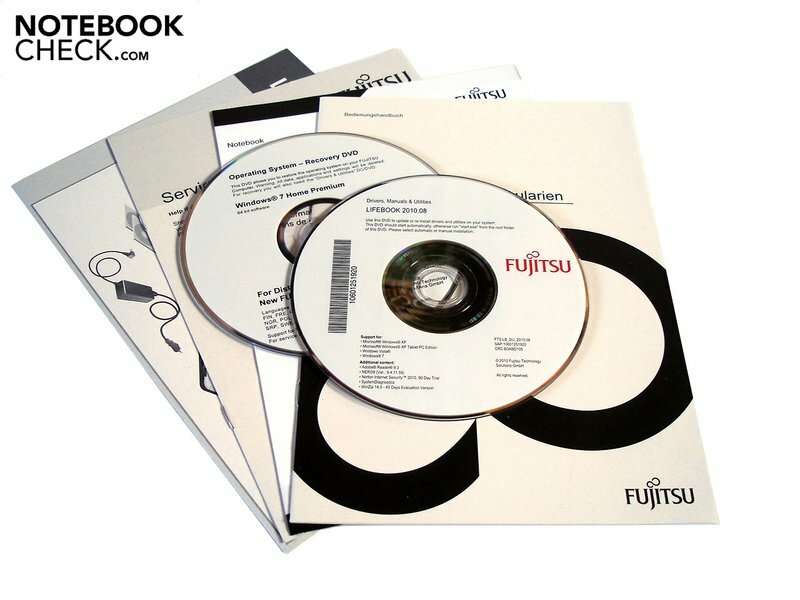 Additionally, Fujitsu adds a driver and tool DVD (with the manual) and a few info brochures to the 15 incher. Fujitsu has done good, even if not overwhelming, work with the keyboard. The perfect layout and the good key size (16x16 mm), with exception of the arrow keys, have to be mentioned positively. We found the typing noise very agreeable. It's neither loud nor clattery. Despite the restricted room, Fujitsu has even accommodated a separate number pad. In return, the keyboard has to accept reproach for the slightly too narrow key gaps and the quite spongy typing feel. In our opinion, the pressure point and stroke isn't sufficiently defined. The touchpad (can be disabled) has for some unexplainable reason turned out extremely small. Due to its size of merely 64 x 35 mm, a frequent re-positioning of the finger is required. However, this problem can be minimized by increasing the mouse velocity. The absence of a practical multi-touch control costs even more points in rating. On the other hand, the smooth surface has to be mentioned positively. It grants good gliding traits. The touchpad doesn't show any weaknesses in terms of precision, either. 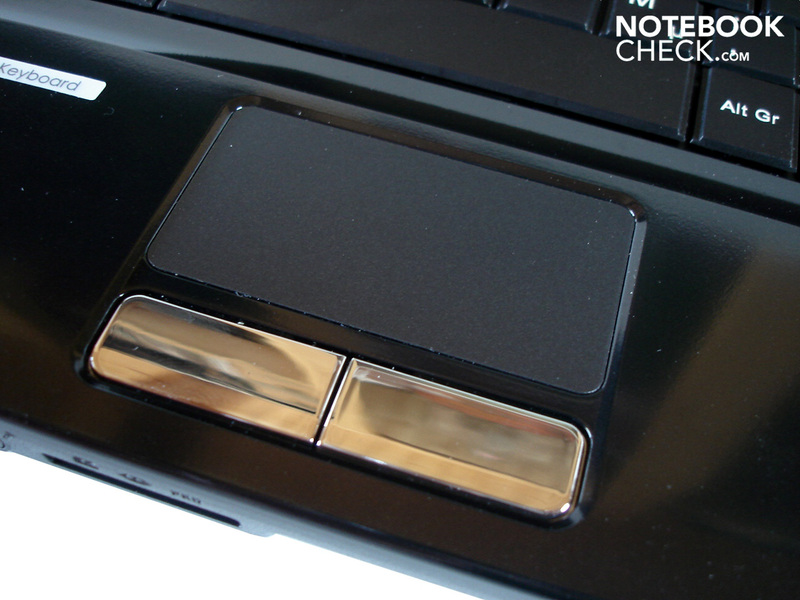 Beyond that, we've nothing to complain about with both touchpad keys. The responsiveness is absolutely convincing. The customer is given the standard display fare. The 15.6 inch display has a screen diagonal of 39.60 cm and includes an LED backlight. The resolution of 1366x768 is common for a 15.6 inch device. However, you will at latest wish for more desktop when several windows are opened at the same time. In return, a resolution of 1366x768 doesn't demand too much power and thus doesn't overly exert the graphics card. The installed LG Phillips screen, LP156WH2-TLAA, is at least able to score with good brightness. A average of 220.3 cd/m2 outshines the majority of competitors and lets games and movies beam in an according light. But, unfortunately, that was it with the advantages. The display is disappointing in the other tasks. It starts with the black value that is everything but low with 1.67 cd/m2. Dark areas have an evident gray cast. This rate would have to be below 0.4 cd/m2 to achieve deep, rich black. The contrast is just as worthy of improvement. 139:1 imply a quite indiscriminate image. Even if the colors are overall alright, they could have been considerably more saturated. Although the fairly high luminosity indicates a good outdoor suitability, an excursion isn't recommendable due to the reflective display. The glossy display surface causes intense reflections in direct sunlight and stresses the eyes unduly. Since you aren't always safe from annoying reflections indoors, you should meticulously look for a perfect place. Now to the viewing angle stability that turns out rather narrow as in many other notebooks. Even the slightest deviations are enough to falsify the image especially on the vertical plane. The viewing angle stability proves to be a bit better on the horizontal plane. However, when several people sit in front of the screen, it's difficult to ensure an acceptable image for everyone anyway. 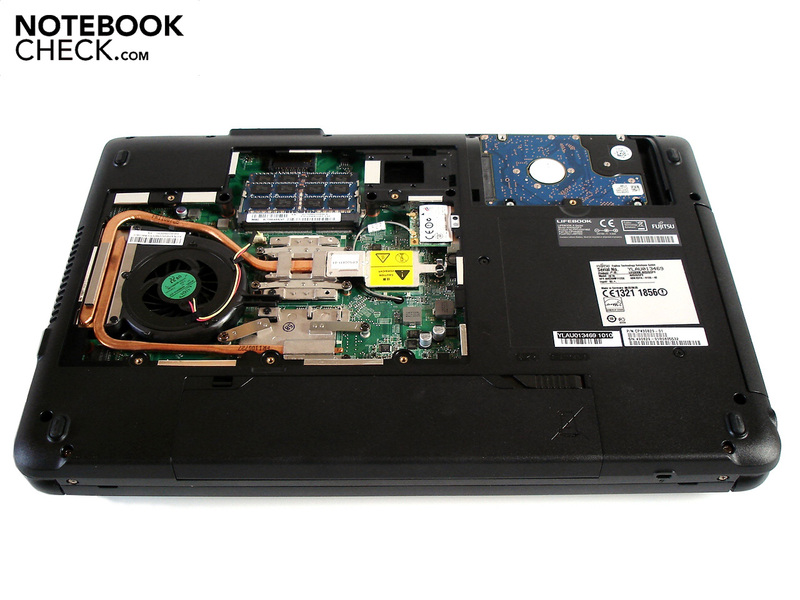 The Lifebook AH530s are all equipped with a current Intel dual core processor. A Core i3-370M does its job in the AH530MF112DE at hand. The midrange CPU for the base 1156 has a three MB L3 cache and a clock rate of 2.40 GHz. The Core i3-370M unfortunately doesn't have an automatic overclocking function, as it is found in the Core i5 and Core i7 processor range. In return, it has the Hyperthreading Technology that simulates two virtual cores and thus allows the Core i3-370M to process up to four threads at the same time. At first glance, the power consumption of 35 watts is quite high. However, the Core i3-370M contains both the memory controller as well as the incorporated graphics chip, GMA HD (disabled in the Lifebook AH530). We would like to restrict ourselves to the benchmark program, Cinebench, for the application performance evaluation. 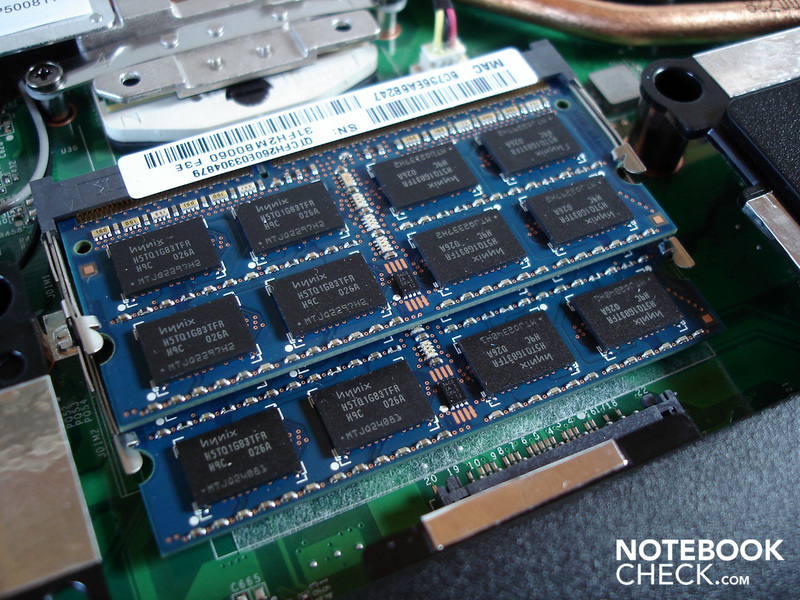 The Core i3-370M was faced with the brand-new Core i5-460M, which is used in a few other Lifebook AH530 models. Due to its slightly higher base rate (2.53 to 2.40 GHz) and the turbo mode, up to 2.80 GHz, the Core i5-460M is usually victorious. The Core i5-460M can, for example, derive an advantage of 16%, with 3852 to 3313 points, in Cinebench R10's single core rendering. The performance difference narrows considerably in multi-core rendering. The Core i5-460M surpasses the Core i3-370M by a whole 10% anyway. Regardless of that, the Core i3-370M makes a good impression in Windows routine. The processor manages all tasks, starting with office, over internet, up to video rendering, perfectly. 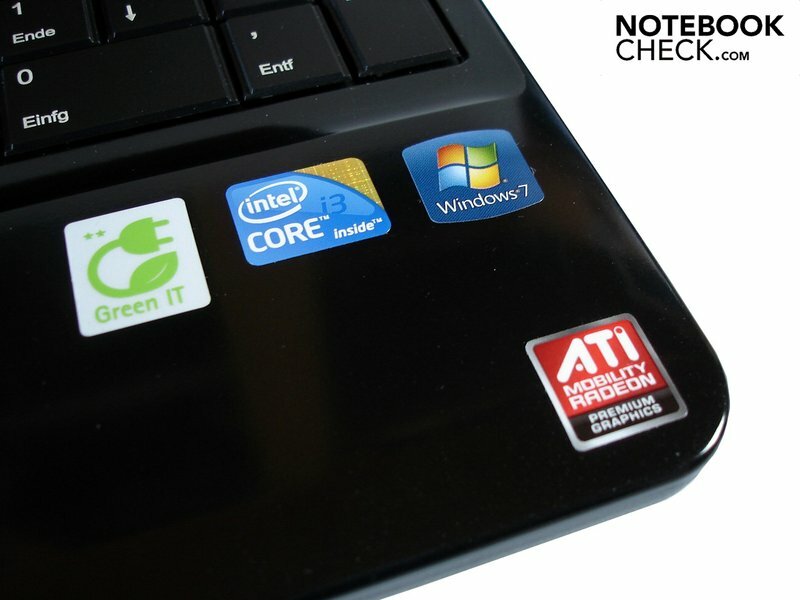 The ATI Mobility Radeon HD 550v takes care of graphics calculation. This mysterious name harbors familiar technology in a new outfit. Thus, the Radeon HD 550v is based on the same chip as the aged Radeon HD 4650. The difference is found mainly in the clock rates. While the Radeon HD 4650 standardly clocks with 550 MHz (core) and 800 MHz (memory), the Radeon 550v only clocks with 450 MHz (core), respectively 600 MHz (memory). Otherwise, both graphics cards manufactured in a structure width of 55nm are similar to the largest extent. 320 unified shaders (Radeon HD 5650: 400 shaders) together with 514 million transistors provide a lot of gaming power. The DDR3 video memory of 1024 MB is sufficiently sized, but the memory connection proves to be quite narrow with 128bits. The combination of DDR3 VRAM and 128 bit memory interface often turns out to be a restricting factor especially in higher resolutions and details. DirectX 11 support isn't available. The user has to be content with DirectX 10.1. We've opted for the GeForce GT 330M, the Radeon HD 550v's main competitor, for comparison reasons in the graphic benchmarks. Nvidia's midrange graphics card also doesn't support DirectX 11 but it has a noticeably higher clock rate with 575 MHz (core) and 790 MHz (memory). The Radeon HD 550v is accordingly defeated by the GeForce GT 330M in Futuremark's 3DMarks. The GeForce GT 330M can surpass the Radeon HD 550v by 15% (18204 to 15767 points in 3DMark03 and by 14% (12664 to 11140 points) in 3DMark05. However the distance in 3DMark06 is even 24% (6528 to 5260 points). The Radeon HD 550v catches up again in the 3DMark Vantage GPU score. Nevertheless, the GeForce GT 330M keeps a 14% lead with 2064 to 1804 points. 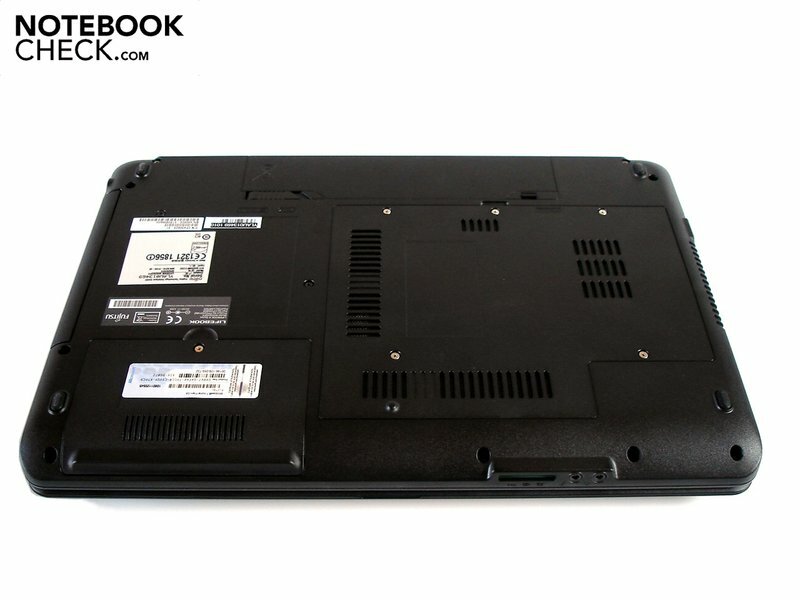 As most 15 inch notebooks, the Lifebook AH530 has only one single hard disk. Fujitsu relies on the manufacturer, Hitachi, and installs a 320 GB HDD with 5400 rpm. Its average transfer rate of 57.2 MB/s is rather moderate (HDTune). A sequential read rate of 61.12 MB/s and a sequential write rate of 60.49 MB/s (CrystalDiskMark) are also everything but exceptional (CrystalDiskMark). Fujitsu has set up the hard disk as a single partition. There are practically 296 GB available. As expected, the Core i3-370M and Radeon HD 550v are too far to endanger our previous reference rates even a bit. Nevertheless, the performance is above average at a price of 630 euro. If you don't have to manage complicated 3D applications every day, the Lifebook AH530 will prove to be a sufficiently strong companion. 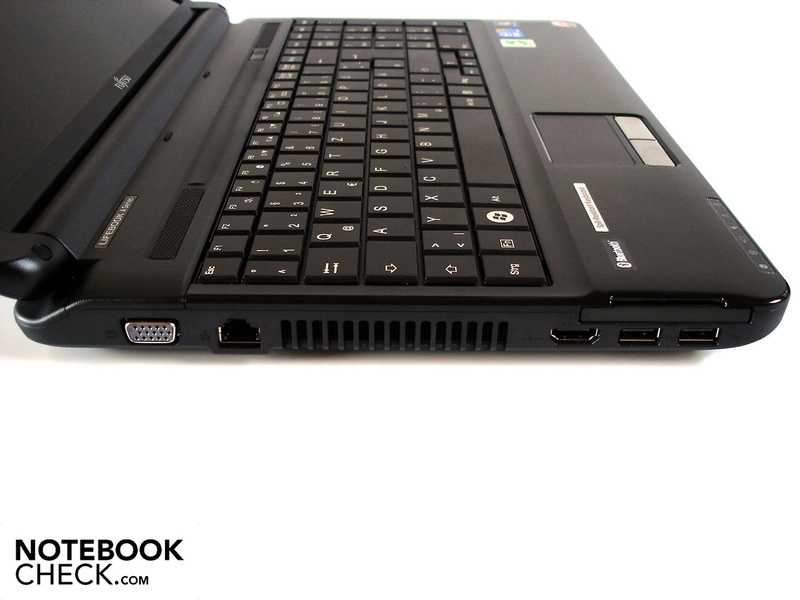 The Lifebook AH530 could already score with a good performance in the synthetic benchmarks. But, what does it look like in games? Will the Radeon HD 550v fail in current tracks? Or are even high details possible occasionally? We sent the Radeon HD 550v together with the GeForce GT 330M over our extensive benchmark course. The atmospherically dense action game first pushes the Radeon HD 550v to its limits in high details and 16x AF (anisotropic filtering). The incorporated benchmark didn't run absolutely smooth in the native resolution with 25.9 fps. The GeForce GT 330M copes better with these settings. 30.0 fps stand for a 16% higher performance. 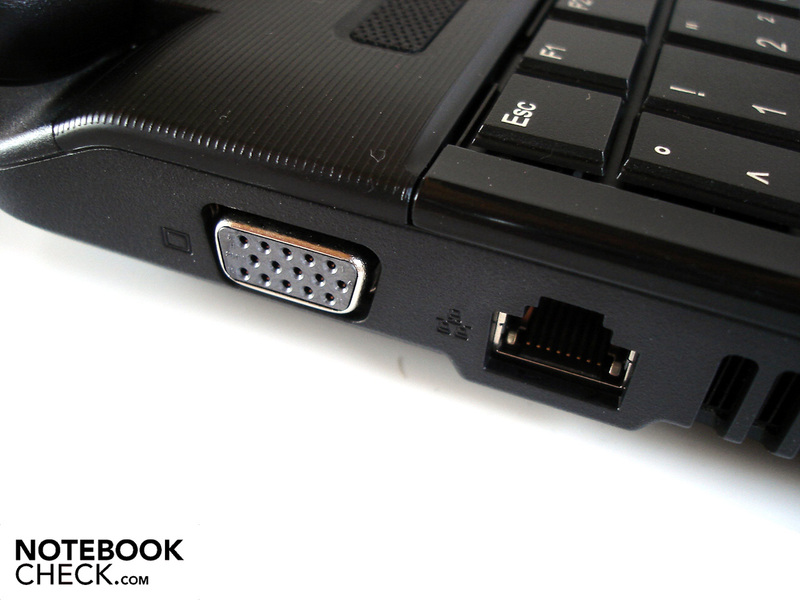 In return, the Lifebook AH530 acknowledges medium details and 8x AF with a playable 31.6 fps in a resolution of 1024x768. The GeForce GT330M only has a slight lead on the Radeon HD 550v in the very pretty Dirt 2. The ATI card achieves adequate 27.3 fps in a resolution of 1366x768, high details and 2x AA (antialiasing). The Nvidia card reaches an average of 29.8 fps (+9%). The technically challenging first-person shooter strains the Radeon HD 550v.extremely. Even when low details, the DirectX 9 mode and a resolution of 800x600 are used, Metro doesn't run completely smooth with 32.6 fps. It's just enough for a meager 20.3 fps in the native resolution with medium details and DirectX 10 mode. Although, the GeForce GT 330M also has a hard time, it processes 17% faster with 23.8 fps. The race game with a touch of realism especially agrees with Nvidia graphics cards. For this reason, the GeForce GT 330M exceeds the Radeon HD 550v evidently. The advantage in a resolution of 1366x768, high details and 4x AA is a remarkable 40% with 27.0 to 19.3 fps. The Radeon HD 550v copes well with Shift, when the resolution is reduced to 1024x768 and medium details and 2x AA are used. 31.9 fps is enough for an acceptable game play. Modern Warfare 2 has considerably lower hardware requirements compared to Metro 2033. For example, high details and 4x AA lead to an almost playable 29.1 fps in a resolution of 1366x768. For once, the GeForce GT 330M hardly works faster. Contrarily, it is on par with 30.1 fps (+3%). The extremely successful strategy hit demands too much from the Radeon HD 550v in high details. Starcraft 2 stuttered noticeably in the intro challenge "For the Swarm" with 19.0 fps. The GeForce GT 330M only has a weary smile for this result. It is superior to the Radeon HD 550v by a remarkable 53% with 29.1 fps. To enjoy Starcraft 2 smoothly in the native resolution, we recommend the medium detail level (33.2 fps). All graphics options can be turned up to full in the latest offshoot of the popular football simulation without hesitation. The Radeon HD 55v is strong enough to render high details and 4x AA in the native resolution very smoothly with 61.4 fps. In Modern Warfare 2's most serious opponent, Bad Company 2, you will inevitably have to be content with medium details. High details and 4x AF don't run smoothly in the native resolution with 21.1 fps. Nevertheless, it still is 7% more than with the GeForce 330M that settles at 19.7 fps. RPGs played in a second person perspective are already perceived as smooth starting at about 25 frames per second. In this regards, medium details and 2x AF aren't a problem. We determined a good 29.1 fps in a resolution of 1024x768. But high details and 4x AF aren't recommendable in a resolution of 1366x768. Risen stutters evidently with 20.0 fps. The GeForce GT 330M follows at a short distance with 19.6 fps. The first-person shooter was the third game in our list where the Radeon HD 550v could surpass the GeForce GT 330M slightly. The ATI GPU places itself in front of the Nvidia GPU by a tight 5% with 23.9 to 22.7 fps in high details and a resolution of 1024x768. Thus, we would recommend medium details for a smooth frame rate. 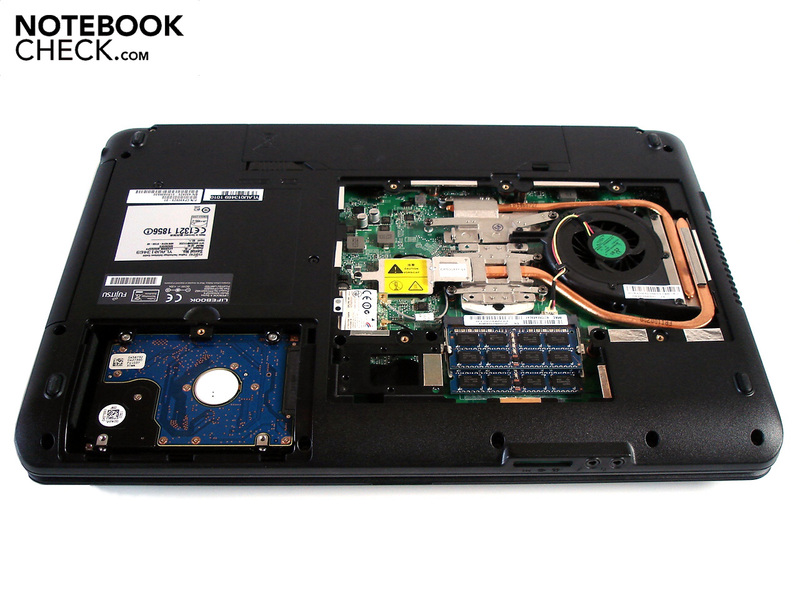 The Lifebook AH530's gaming performance can be described as adequate. If you forgo on performance sapping quality enhancements (especially antialiasing), most current games can usually be played in medium to high details. You shouldn't expect the Radeon HD 550v to cope with resolutions higher than 1366x768 because the performance would cave in visibly. 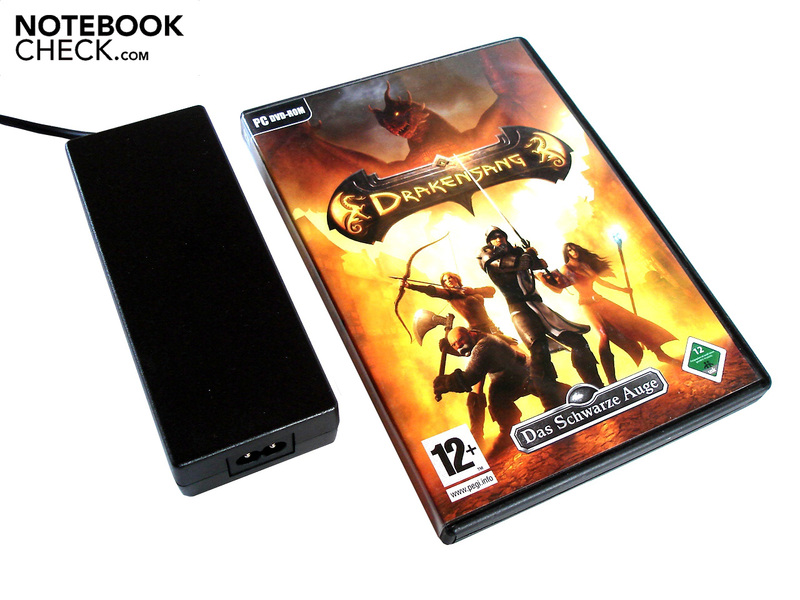 Thus, the Lifebook AH530 is only suitable for casual gamers who don't want to play every game in a Full HD resolution with maximum details at all costs. In comparison to the GeForce GT 330M, the Radeon HD 550v copes quite well. Both graphics cards are more or less on par with exception of a few tracks (e.g. Starcraft 2 & Shift). Generally, the GeForce GT 330M can bear up against the Radeon HD 550v (1366x768, high details). 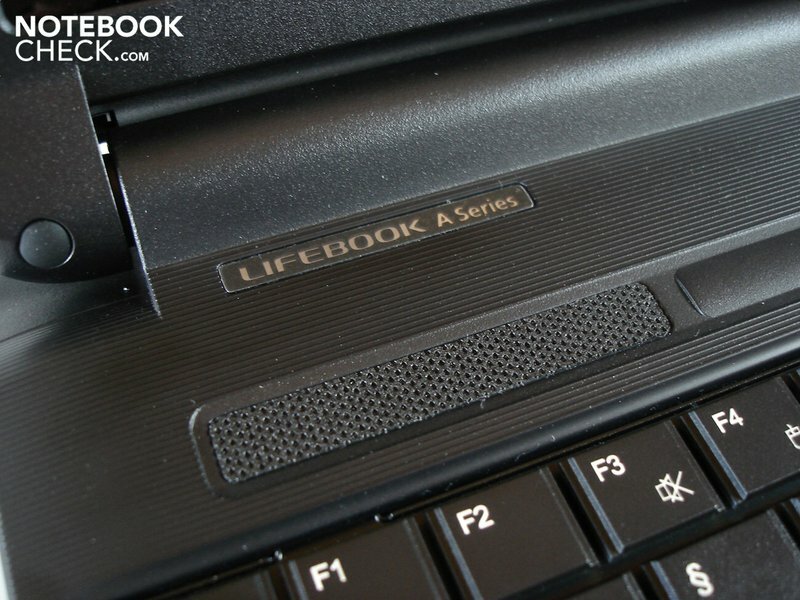 The low soundscape is one of the Lifebook AH530's biggest strengths. In low load (office, internet, etc. ), the case fan can only be enticed to emit a quiet whirring. The notebook temporarily works almost silently. The hard disk also behaves pleasantly quiet, except for single clacking. The optical drive doesn't provide reason for complaint, either. It doesn't drown out the DVD soundtrack. The fan even only turns up insignificantly under load. There is currently hardly another notebook with which gaming is quieter. The case fan first clearly attracted attention as we loaded the 15 incher to full with the tools, Prime and Furmark. 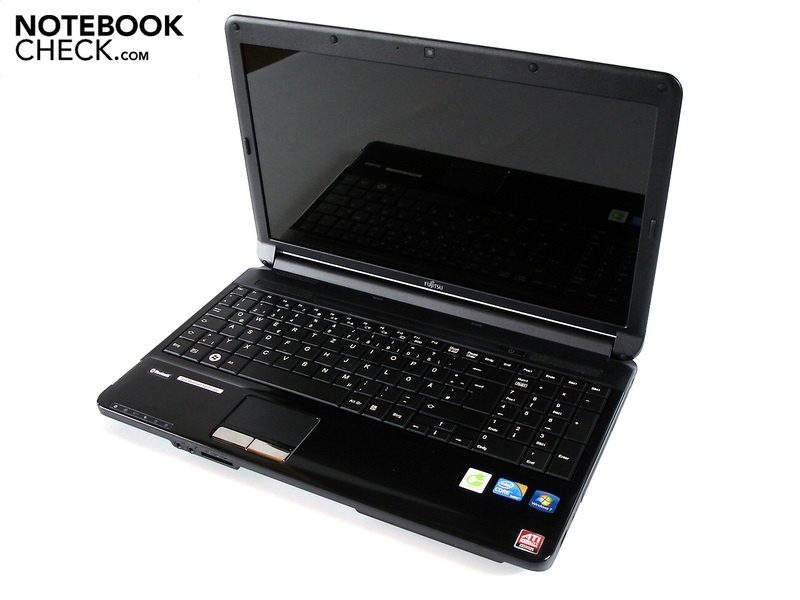 Nevertheless, the Lifebook AH 530 is never disturbing. The fan's behavior has earned additional praise. The fan quickly turned down to its normal speed after the full load test was finished. 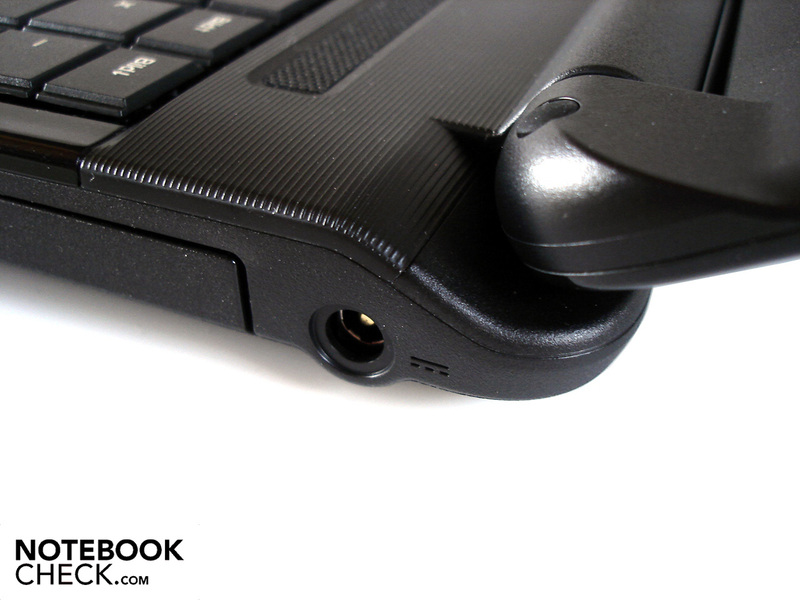 Conclusively, it can be said that noise sensitive users will make the right choice with the Lifebook AH 530. The temperature development can't quite keep up with the very good system noise. 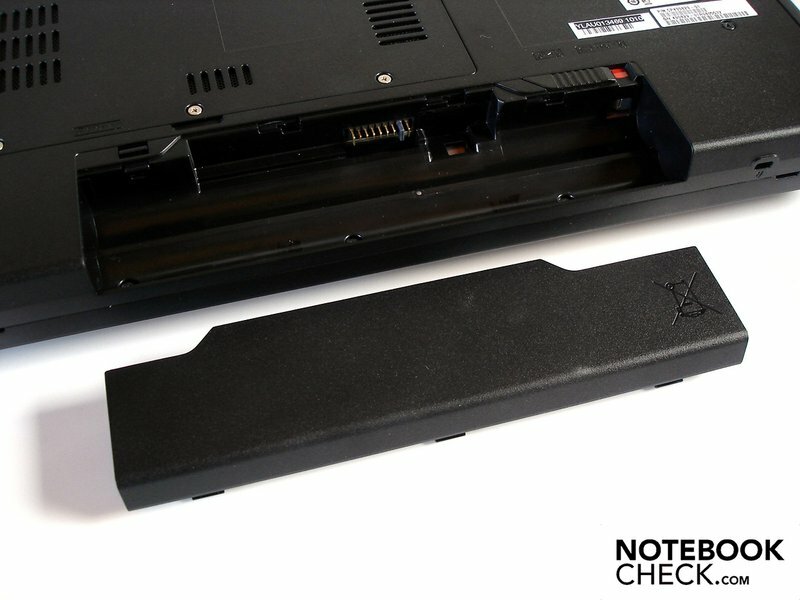 The notebook's top comes off best, which remains fairly cool with a maximum of 35.8°C in both idle mode and under load. The wrist-rest only gets lukewarm. 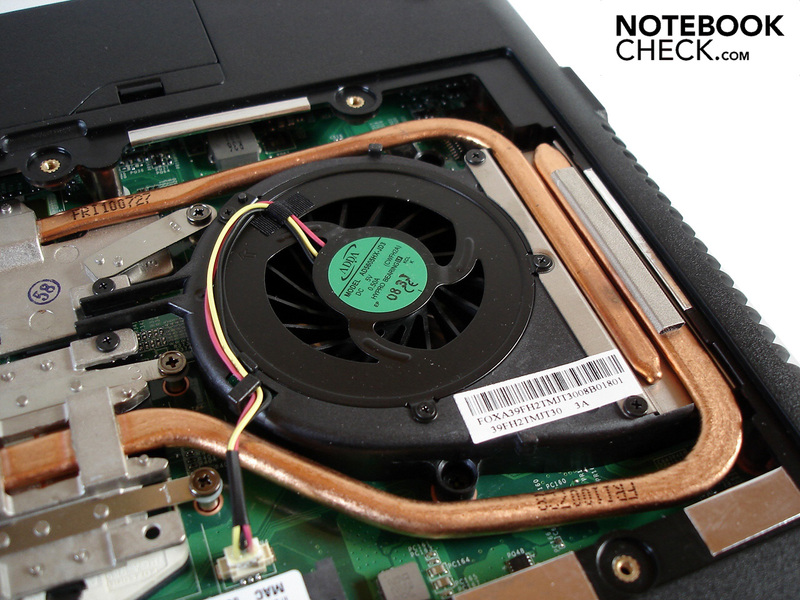 In return, the notebook's bottom already heats up to over 40°C in idle mode. The one or other user will likely find such a temperature unpleasant on the lap. The component's temperature is really a reason for concern. Thus, the Core i3-370M and Radeon HD 550v were already located at about 60°C in idle mode - below 50°C would be normal here. The next unpleasant surprise followed during our full load test (Furmark + Prime). As soon as the processor exceeded a temperature of over 90°C, it clocked down for a certain amount of time to a meager 1.33 GHz (CPU throttling). Fortunately, there were no irregularities during our application and gaming benchmarks. In fact a full load situation is never achieved in routine use. (±) The average temperature of the palmrest area of similar devices was 29.1 °C / 84.4 F (-1.2 °C / -2.1 F). 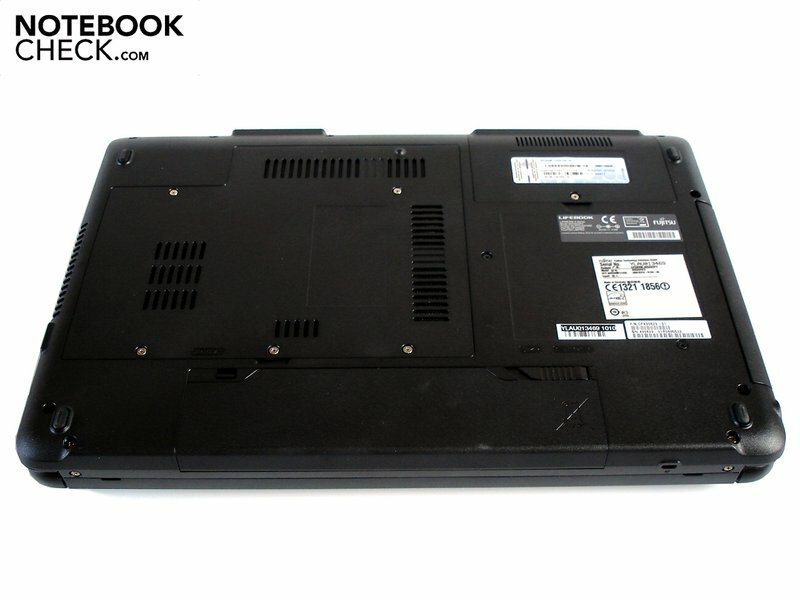 The Lifebook AH530's speakers unfortunately belong to the worst that can be found in the notebook division. Both speakers, located above the keyboard, taunt the user with an extremely muffled, imprecise and unnatural sound. Annoying static noise quickly turns up under a too high load. The right loudspeaker generally distorts the sound. Bass isn't worth mentioning either. The speakers lack force and volume. Additionally, there is a quite limited maximum volume, which almost has to be seen as an advantage in view of the described shortcomings. In short: To enjoy music, movies and games adequately, external loudspeakers or a headphone is mandatory in any event. 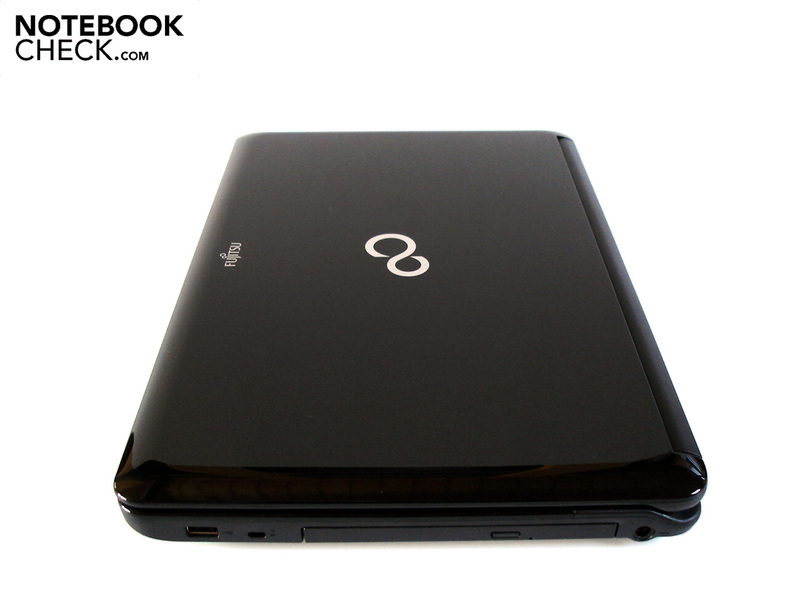 The Lifebook AH530 places itself in the midfield in terms of battery life. The notebook can survive for almost 3.5 hours away from the mains in optimum conditions. That is minimum brightness, maximum energy saving options and low load (BatteryEater's Reader's Test). About 2.5 hours of wireless internet surfing are possible when medium energy saving options and the maximum brightness level is used - a good result. On the other hand, the DVD runtime could be a bit better. About an hour and 46 minutes aren't enough for all movies. The 15 incher's battery is drained after not even an hour under load (BatteryEater's Classic Test) with maximum brightness and disabled energy saving mechanisms. 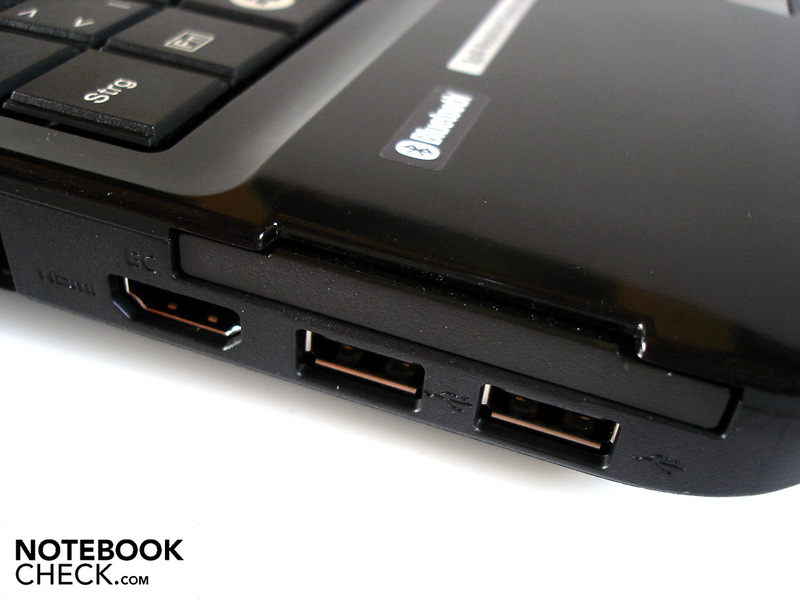 The Lifebook A530, without a dedicated graphics card has a better battery life of partly over 50%. The energy requirement is perfectly fine for the given performance. 17.0 - 23.4 watts in idle mode and 42.2 - 75.5 watts are within the usual limits for multimedia notebooks. Comparably fast devices, such as the Toshiba Satellite A660-151 have similar consumption rates. 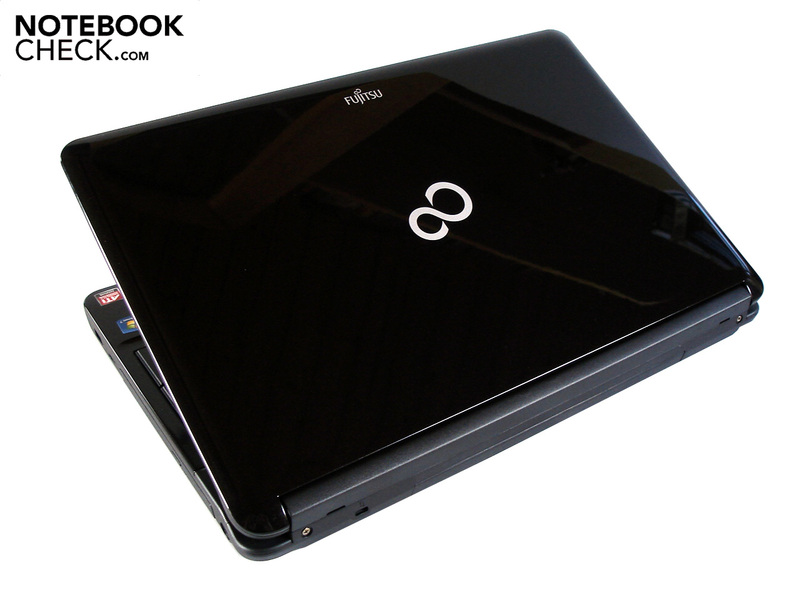 Overall, Fujitsu has set up a well-balanced multimedia notebook that is equally suitable for numerous application purposes in the Lifebook AH530. It can't only server with a good performance due to Core i3-370M and Radeon HD 550v, but also with a good gaming performance. Although you may sometimes be a lot faster with other midrange graphics cards, such as the Radeon HD 5650, the Lifebook AH530 is a very fair offer in view of the price of about 630 euro. The performance for value ratio is appropriate. Another unique feature is the low soundscape. The fan stays pleasantly in the background. 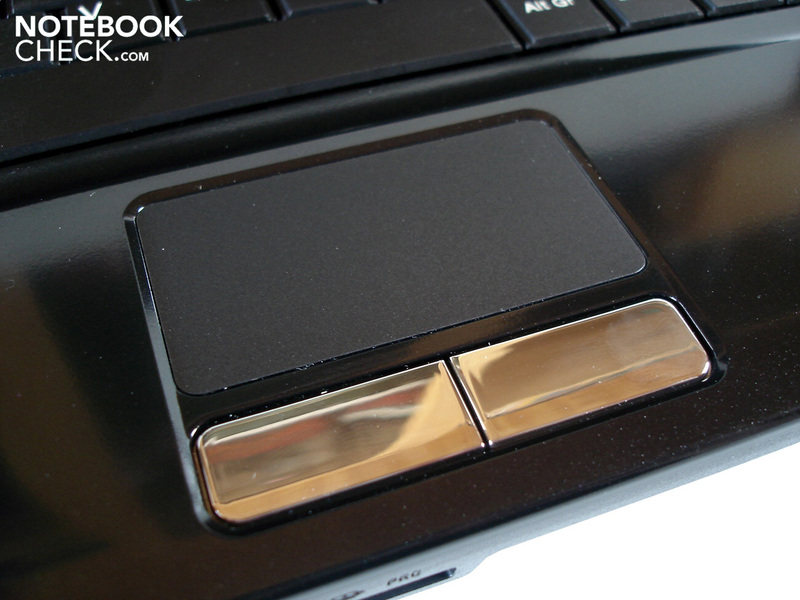 In return, we didn't like the sensitive high-gloss surfaces and the extremely small touchpad as much. The loudspeakers have to almost be described as an impertinence. Such poor sound quality is hardly ever heard. Nevertheless, the display remains to be the main point of critique. Although it can score with a high brightness, the contrast ratio, the black value and viewing angles have considerable shortcomings. 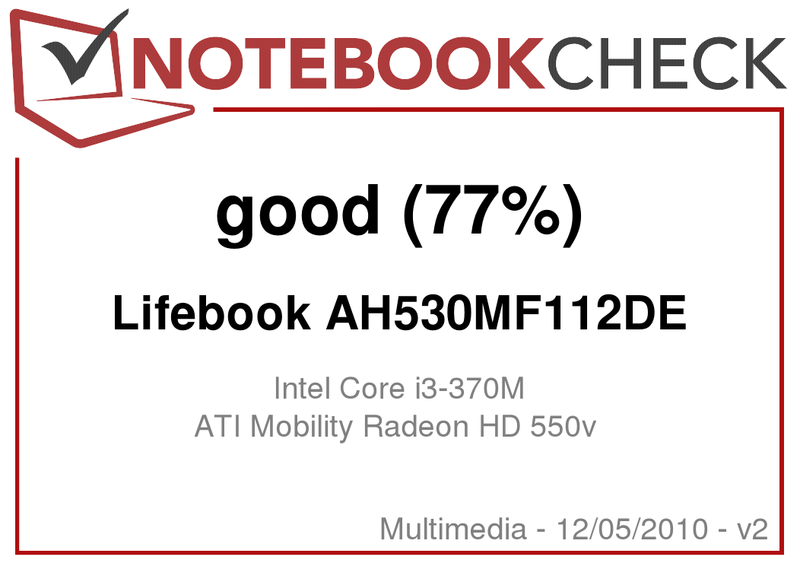 If you are looking for a cheap-as-possible and yet fairly strong notebook, and if you don't have too high demands on the display, you may take Lifebook AH530. 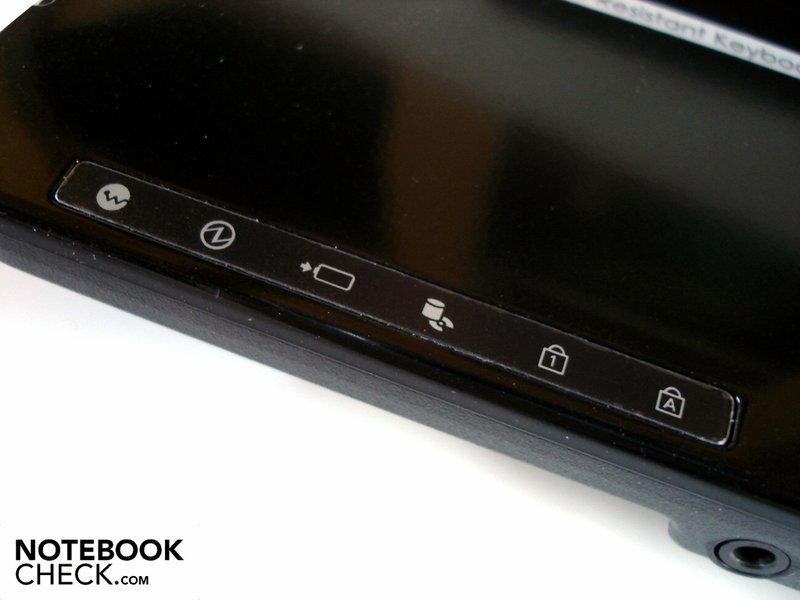 The Lifebook AH530 is made in deep black. The given sound quality is quite poor. The right loudspeaker clearly distorts the sound. 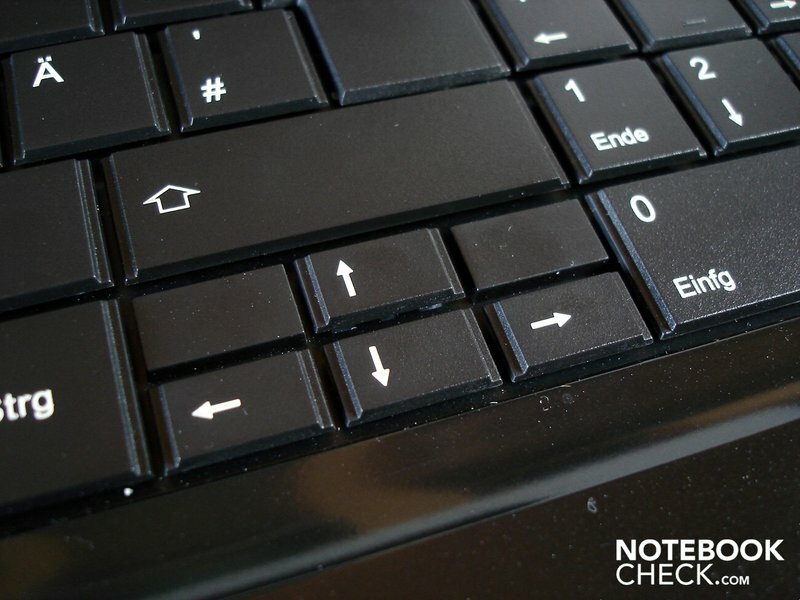 All keys are nicely sized, with exception of the arrow keys. The touchpad has turned out extremely tiny. The typing feel could be a bit clearer. The case has to be lifted for inserting the battery. 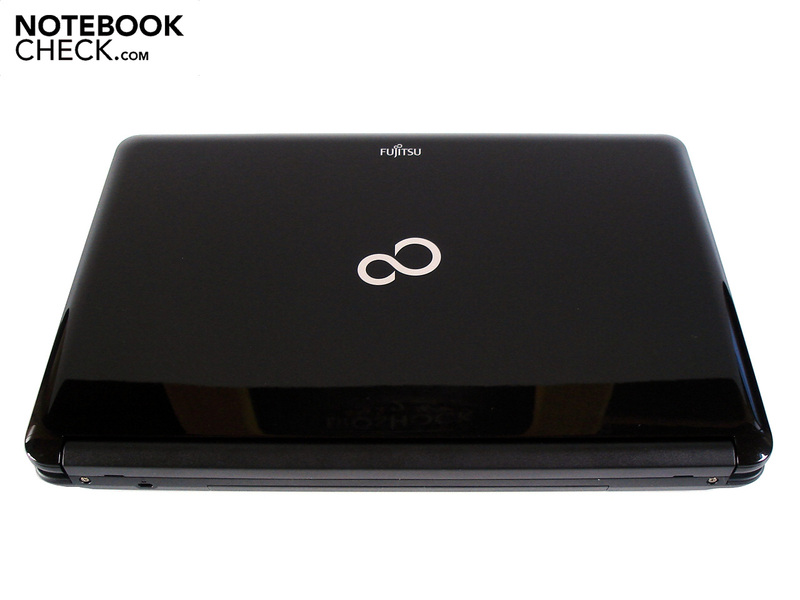 .A small Fujitsu logo on the notebook's lid. Windows 7 Home Premium serves as the operating system. The Kensington lock is fairly far in the front. VGA out and RJ-45 Gigabit LAN are on the left. 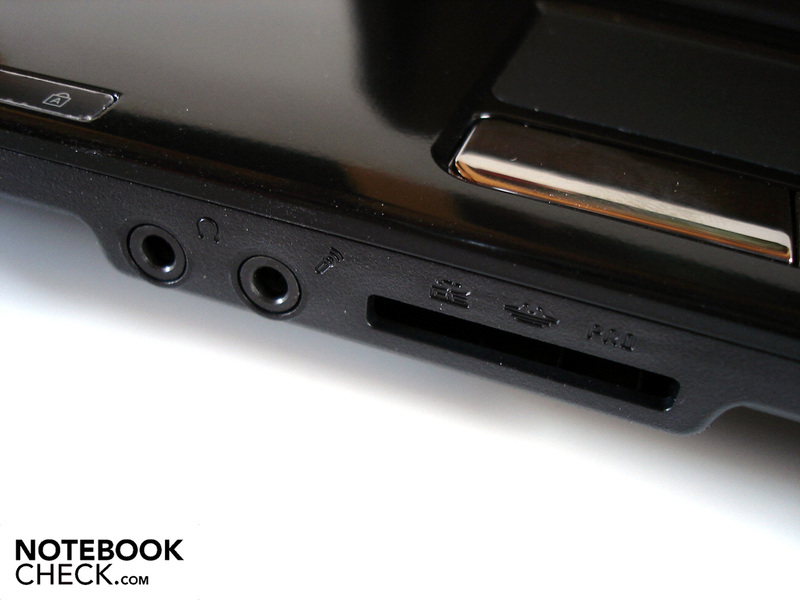 Other ports could be obstructed when the ExpressCard slot is used. Numerous status LEDs are on the wrist-rest. Fujitsu has installed audio sockets and cardreader on the front. 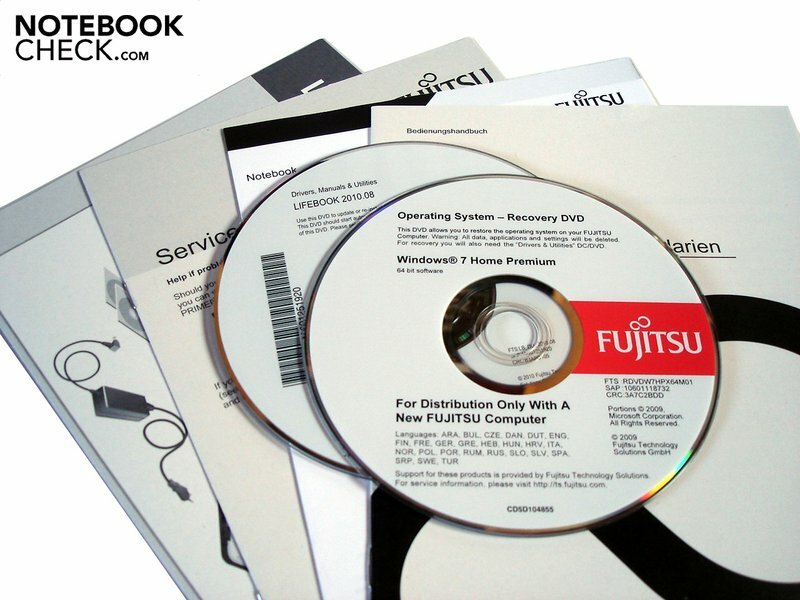 Windows 7 is supplied as a recovery DVD. Naturally, a driver and tool DVD shouldn't be forgotten. The display bezel is one of the few matt elements. The installed webcam has a resolution of 1.3 megapixels. The case has a good stability. The base unit lifts extremely when it's opened. The high-gloss surfaces are very sensitive. The maximum opening angle fully is alright. The case weighs around 2.5 grams. Design and styling are favorable. The majority of ports are placed on the left. The case size is 378 x 252 x 39 millimeters. A chic logo adorns the notebook's lid. All important components can be accessed. 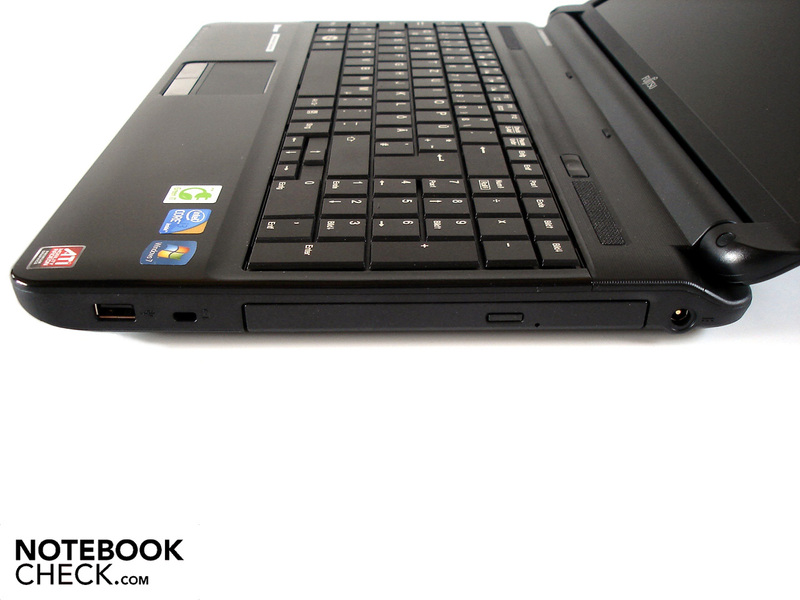 The Lifebook AH530 works agreeably quiet. Core i3-370M and Radeon HD 550v bid a good performance. Four GB of DDR3 RAM are now standard. The 320 GB HDD isn't one of the fastest hard disks. The fan can easily be cleaned. The 80 watt adapter is relatively small. The excellent value for money ratio. More application and gaming performance is hardly possible for a price of a bit over 600 euro. A contrast richer display with a better black value and more generous viewing angles. Higher quality loudspeakers would have been nice, too. 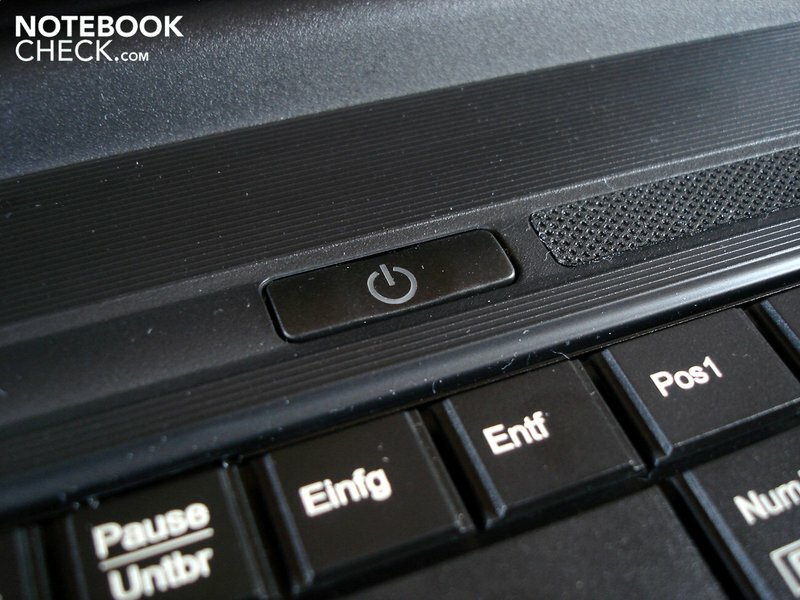 How quiet the Lifebook AH530 is even under load. It's focused on relaxed multimedia entertainment. 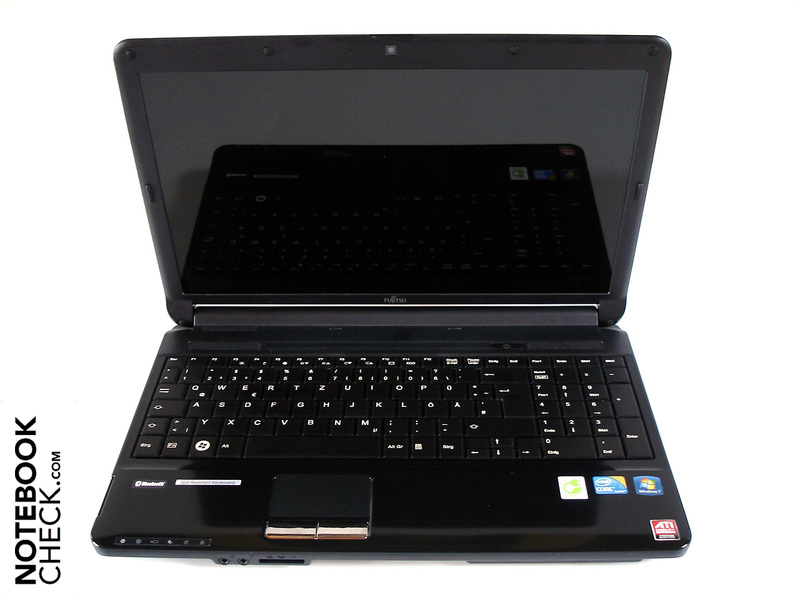 15 inch multimedia notebooks with lots of power under the hood, such as the Toshiba Satellite L650D, the Toshiba Qosmio F60, the Sony Vaio EB1S1E, the Acer Aspire 5820TG, the Acer Aspire 5625G, the Packard Bell EasyNote TX86, the Packard Bell EasyNote TJ75, the Samsung R580, the Samsung R590 or the mySN XMG A500.